At John’s Auto Body Collison Inc., we are committed to serving the community and earning your business by making you, the customer, our number one priority. With over 30 years of service in Dedham, we are proud to offer a professional, knowledgeable staff, cost-effective repairs, fast response times and the ultimate in customer service. We believe we have the best auto body shop in the area and if you let us serve you, we will make a believer out of you too. We’ve all been there, on the Internet searching for a ‘body shop near me.’ You don’t know where to go, who to trust or what to do. At our Dedham body shop we can get your ride back on the road looking like nothing happened. We are so committed to our customers and confident in our work that we guarantee your paint job for as long as you own your vehicle! 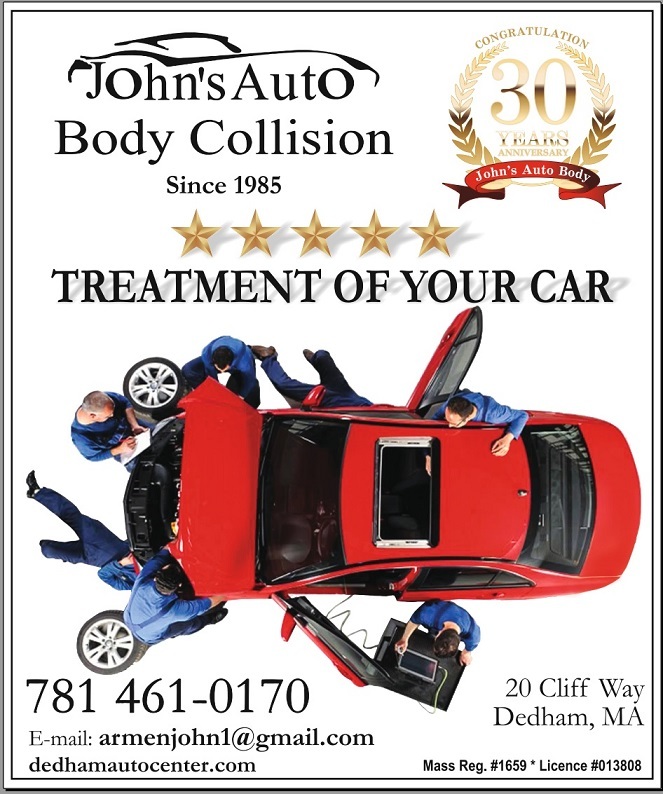 We are your Boston body shop, here for you and your collision repair needs. Insurance companies can be confusing and difficult to work with. At our auto body shop, we welcome insurance work. We handle the negotiations and paperwork for you. We can also tow your vehicle and arrange a rental car if you need one. If that’s not convenient we offer a pick-up and delivery program or you can drop off your vehicle after-hours. Our goal is to provide cheap auto body repair with exceptional customer service. From auto body repair to car painting, brakes, shocks, struts, mufflers, tune-ups, timing belts or radiators, you can trust John’s Auto Body Collision Inc., for your repair needs. We provide comprehensive auto repair completed by a dedicated team. After an accident, we ensure that your vehicle is safe, road ready and looking like nothing happened. From minor dents to extensive structural damage, we have you covered. We have state-of-the-art equipment, we use cutting edge technology and we have technicians that are highly skilled in the field. Call us today and let us help get your vehicle on the road to recovery. We value the relationships we build with our clients. © John's Auto Body. All rights reserved.